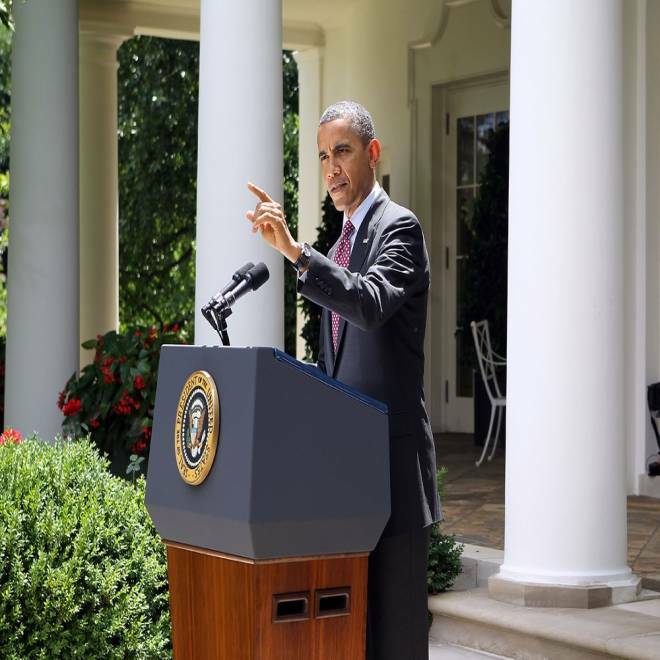 President Barack Obama makes remarks about the Department of Homeland Security's recent announcement about deportation of illegal immigrants in the Rose Garden at the White House June 15, 2012 in Washington, D.C. Updated 4:18 p.m. ET - The Obama administration announced on Friday that it would no longer seek the deportation of most young illegal immigrants, and would instead allow them to apply for work permits, a significant policy shift with potentially major electoral implications. The Department of Homeland Security said that, effective immediately, the government would no longer seek the deportation of illegal immigrants who were brought to the United States as children, and would allow them to apply for work permits if they meet certain criteria. The decision was intended to make America's immigration system "more fair, more efficient and more just," President Barack Obama said in an afternoon statement in the Rose Garden. "They were brought to this country by their parents, sometimes even as infants, and oftentimes had no idea they were undocumented until they applied for a job," the president said. "They are Americans in their hearts, in their minds ... in every single way but one: on paper." President Obama announces that the Department of Homeland Security will no longer seek the deportation of many young illegal immigrants. A senior administration official said in a conference call with reporters that as many as 800,000 undocumented immigrants stand to benefit from this change. Homeland Security Secretary Janet Napolitano said that the shift represented neither immunity nor amnesty -- buzzwords for conservatives who oppose illegal immigration -- but instead represented an instance of "prosecutorial discretion" in which the government had re-evaluated its priorities in enforcing the law. "This is not amnesty; this is not immunity; this is not a path to citizenship," Obama said, calling today's move a "temporary fix." 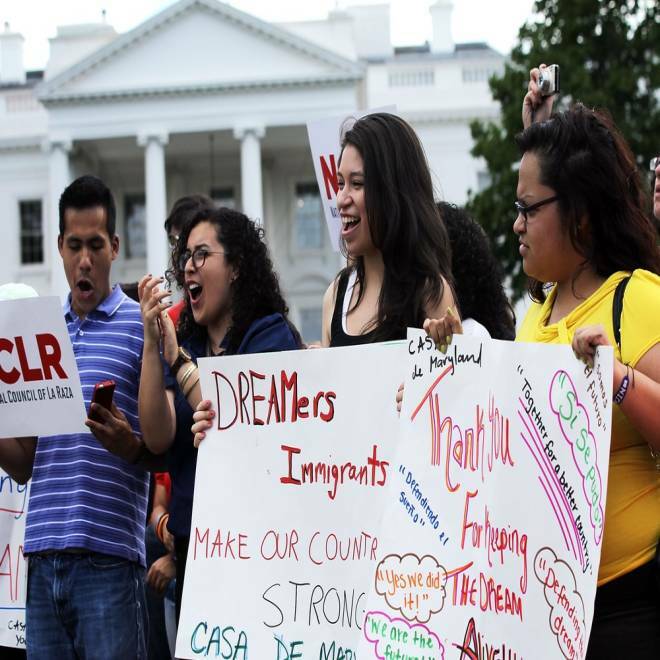 The shift essentially accomplishes many of the legislative intentions of the DREAM Act, an immigration reform bill that had stalled in Congress due to Republican objections. President Barack Obama favors the legislation, while presumptive Republican presidential nominee Mitt Romney has said he would veto that law. The new rule comes amid a bruising election year fight between Obama and Romney, in which the Latino vote could be decisive. Obama enjoys a strong advantage with Latino voters, winning 61 percent of Latinos vs. 27 percent for Romney in a mid-May NBC News/Wall Street Journal/Telemundo poll. Romney, speaking to reporters in New Hampshire, said he thought that the status of children who were brought to the United States illegally is important to resolve, but only on a long-term basis. "I think the action that the president took today makes it more difficult to reach that long term solution because an executive order is, of course, just a short term matter. It can be reversed by subsequent presidents," Romney said. He didn't say whether he would seek the new rule's reversal. "If I'm president, we'll do our very best to have that kind of long term solution that provides certainty and clarity for the people who come into this country through no fault of their own by virtue of the actions of their parents," the former Massachusetts governor added. The Hispanic vote is of particular importance in swing states like Nevada, Colorado, New Mexico and Florida, among others. Those states could swing the election toward Obama or Romney, elevating the importance of the margin between the two candidates with Latino voters. Immigration activists gather in front of the White House to celebrate the Obama Administration's announcement about deportation of illegal immigrants June 15, 2012 in Washington, D.C.
Obama's biggest challenge, though, has involved motivating Latino voters to turn out for him with the same strength they had in 2008. The president had faced lingering complaints stemming from his inability to advance the comprehensive immigration reform he had promised as a candidate in 2008. The president tweaked Republicans in Congress for blocking the legislation, saying that he continued to favor both the full DREAM Act as well as a broader comprehensive immigration reform package that would allow a pathway to citizenship. "There's no reason that we can't come together and get this done. And as long as I'm president, I will not give up on this issue," Obama said. In a memorandum to immigration enforcement officials, Napolitano wrote that immigrants who were illegally brought to the United States as children "lacked the intent to violate the law," and pose few national security risks. A senior administration official noted that the new rules were not permanent, though, and conceded that a different administration with a different policy could conceivably choose to withdraw this regulation. "The executive can always change its mind about how to exercise discretion," said the official. Arizona Governor Jan Brewer responds to President Obama's immigration policy announcement on Friday. The policy shift presents a challenge for Romney, who ran to the right of some of his opponents on the issue of immigration during the Republican primary. He had opposed the DREAM Act, and explained during a debate that his immigration policy involved "self-deportation." That hard-line stance prompted handwringing among Republicans who have long worried about the long-term political fallout associated with alienating Latino voters. Florda Gov. Jeb Bush suggested earlier this week that much of the Republican rhetoric surrounding immigration had been "insulting." "Change the tone would be the first thing," he said of his advice to Republicans. "Second, on immigration, I think we need to have a broader approach." Ironically, the Obama administration's new rule would accomplish many of the same goals of a limited version of the DREAM Act proposed by Florida Republican Sen. Marco Rubio, which stops short of offering young illegal immigrants citizenship, but gives them a type of legal status. Romney said he was considering the proposal from Rubio, a popular choice of conservatives to round out the Republican ticket as a vice presidential nominee. In a statement, Rubio straddled praise and criticism for the move. "Today’s announcement will be welcome news for many of these kids desperate for an answer, but it is a short term answer to a long term problem," he said. "And by once again ignoring the Constitution and going around Congress, this short term policy will make it harder to find a balanced and responsible long term one." Romney said of Rubio: "I'd like to see legislation that deals with this issue and I happen to agree with Marco Rubio as he considers this issue. He said that this is an important matter, we have to find a long term solution but the president's action makes reaching a long term solution more difficult."